These days, artificial intelligence is seen everywhere. For instance, if you’re on a website shopping for a pair of shoes or even a college degree program, there is likely a box in the corner of the screen that pops up that asks if you need help, ready to respond to your questions in real time, without a person actually answering them. 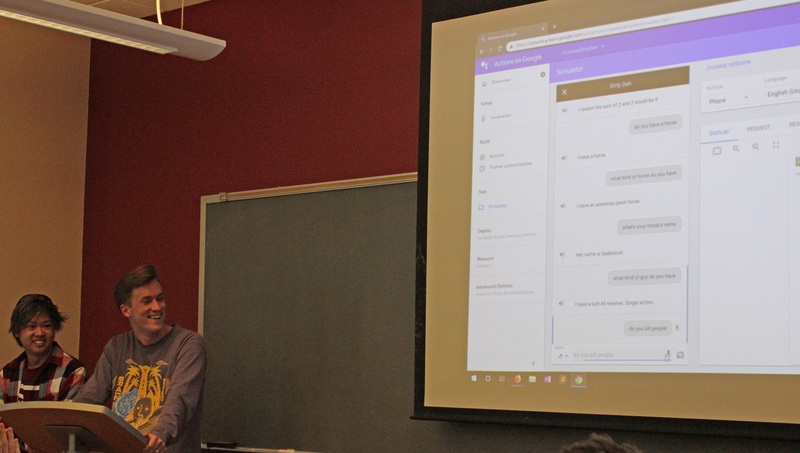 Students at The University of New Mexico Department of Computer Science are getting a strong foundation in this ever-growing technology through a course dedicated specifically to it that uses chatbots to help students learn. Lydia Tapia, an associate professor of computer science, has been teaching Introduction to Artificial Intelligence (CS427/527) for several years. A key component of the course involves an interactive project where students create chatbots, or intelligent agents that are supposed to interact as a human would. Students in the course formed teams and began working on their chatbots at the beginning of the semester. The chatbots included a Harry Potter character, a bird expert, a cowboy named “Dirty Dan, a “dark” version of Batman, and a character based on Eric Cartman, a sarcastic child from the “South Park” television cartoon show. Students were encouraged to define a topic area expertise so the chatbot could focus the conversation on a certain set of parameters. Students programmed each chatbot to closely mimic the character’s personality so that it would sound more human-like and realistic. This semester, the chatbots got a major upgrade, thanks to a Google Cloud for Education grant that Tapia was awarded. 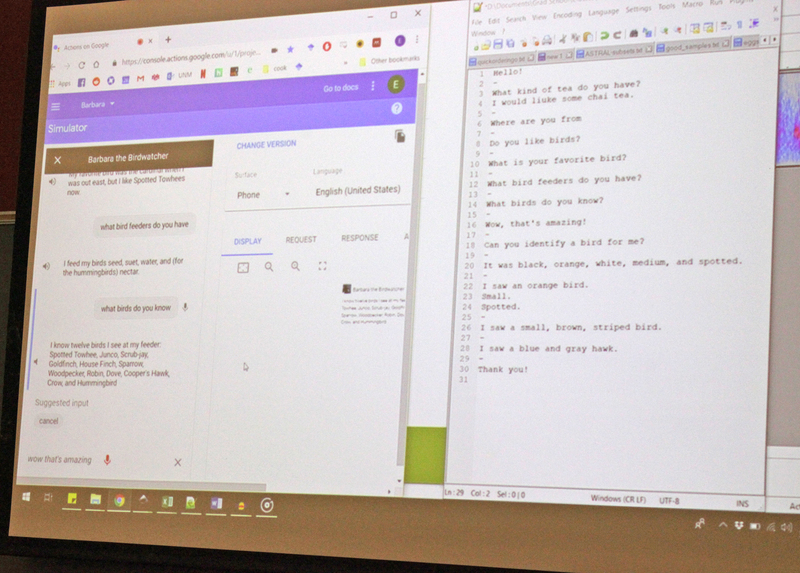 Tapia received $2,800 for Google Cloud Credits so the students could implement the chatbots through Google Assistant, which enables students to literally talk to their chatbots instead of just carrying on the conversation through a keyboard. The chatbots could converse through a computer, through a phone, or even a Google Home device. The conversations were sometimes predictable, sometimes comical — and sometimes went a little astray. Cartman: You sure want to know a lot about a little kid. I don’t want to say! Question: What is your favorite food? Dirty Dan: I reckon it’s steak and potatoes. According to student Chris Salinas, a senior in computer science, that’s a common question that someone may use to test the “humanness” of a bot. Salinas said the class has given him a good foundation in AI. “I’ve learned how to approach a problem from the solution, then working backwards to figure out the steps involved to get to the correct answer,” he said. Tapia said she enjoys teaching the course because it forces students to think creatively while exercising strong technical skills that are needed in today’s AI-focused world. Students voted on the best chatbots. Barbara the Bird Lady won the graduate competition, and Cartman won the undergraduate. This is not the only project Tapia is working with that involves Google. Last summer, Google began funding a new program at UNM to attract more female undergraduates to graduate school, one of 15 institutions nationwide to receive Explore CSR (computer science research) grants from Google.